All products subject to the Australian (ACMA) EMC regulatory arrangements must comply with an applicable EMC technical standard. These standards are not unique to Australia and they form the basis on which CE reports are made for the European Union. They are also used by other countries in part of their EMC Compliance processes. In addition to the EMC technical standards Australia has addition requirements for documentation that vary from the EU and other countries. The required level of compliance depends on the risk of interference that may be expected from the product. The higher the risk of interference, the higher the level of documentary evidence required. Most product on the market falls into Compliance Level 2/Medium Risk device. Note that Australian (ACMA) EMC requirements do NOT include immunity testing as mandated in the EU. The Australian (ACMA) requirements are a subset of the EU's requirements. Also the EU's product compliance mark the CE Mark cannot be used as an alternative to the Australian Regulatory Compliance Mark. Low-risk devices may include: battery-powered LED torches, battery-powered pocket calculators, battery-powered clocks, wrist watches and battery-powered toys. It does not include ALL battery powered devices. Must comply with one of the applicable standards. Labeling with the Regulatory Compliance Mark (RCM) is not required. No Declaration of Conformity is required. Medium-risk devices include but are not limited to: Whitegoods, IT equipment, Audio visual equipment, Machinery, Lighting and Battery Chargers. In general products that can be connected to the AC mains. a technical file showing the device(s) complies with an applicable technical standard via a test report. The test report in the file does not have to be from an accredited laboratory and does not have to be from an Australian laboratory. 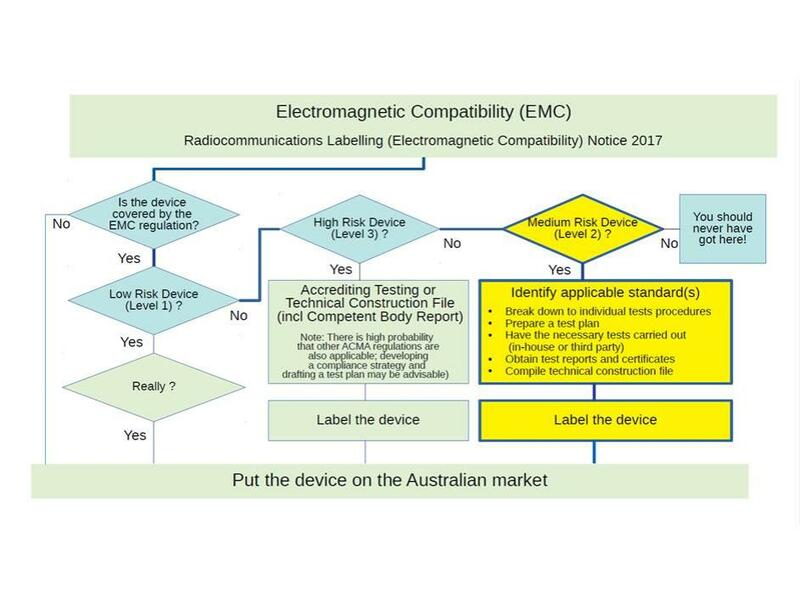 Most Compliance Level 2 product placed on the Australian market is imported and already tested to an applicable EMC standard by accredited laboratories. description of the device, with a model number that can be linked to the test report, internal and external photographs. In those case where several models are linked to one test report the technical file should contain a justification. This could be that the differences between the models do not affect the EMC characteristics of the models or that the most representative model(s) were tested. The justification becomes more significant when families or groups of products are based on a common design. For example this is the case with most lighting products. A high-risk device is a device described as 'Group 2 ISM equipment' in AS/NZS CISPR 11:2004 (2nd Edition). Group 2 contains all ISM equipment in which radiofrequency energy is intentionally generated and/or used in the form of electromagnetic radiation for the treatment of material, and EDM (electro-discharge machining) and arc welding equipment. The documentary evidence requirements for high-risk devices are the same as medium-risk devices except the test report must be produced from an accredited test lab. The accredited lab does not have to be an Australian test lab and may be accredited by non Australian organizations with which Australia holds mutual recognition agreements.